When you consider that burpees are often done in high-rep sets (say, seven minutes of burpees or a 100-burpee workout), you can imagine how quickly the misery accumulates. After all, a single burpee demands that your entire body work to perform six bodyweight movements in a row (including three separate jumps) that take you from vertical to horizontal, back to vertical again. The fact that the burpee is used as a punishment -- as in Spartan Races, which require participants to do 30 in a row if they fail to take on an obstacle, or at CrossFit gyms that assess a burpee penaltyfor arriving late to class -- tells you pretty much everything you need to know about this killer movement as we now know it. Three separate jumps and a pushup (or some variation of it): It puts the hurt on you, and it does it good and fast. In short, Burpee never intended his modest, four-count move to be used as a particularly hard-core way to get in shape. But thanks to the popularity of high-intensity strength and conditioning programs like CrossFit and boot camps, and events like Spartan Races and Civilian Military Combines, it's a little late to be asking "WWRHBD?" 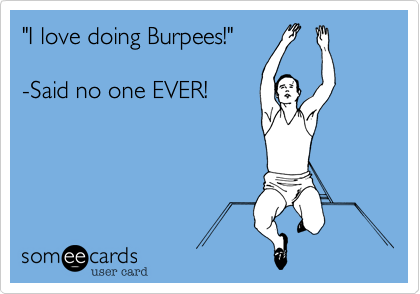 Not only is the six-count burpee probably here to stay, it's brought along its even more challenging friends -- variations like burpee box jumps, thedumbbell burpee, the (ouch) burpee pull-up and countless other varieties.